Share and sync Google Calendar™ with Microsoft Outlook. If you are looking for a quick and easy way of syncing Microsoft Outlook folders with the Google Calendar service and planning to share Outlook folders with your friends, this program is for you. Synchronize multiple Outlook Calendars folders with the Google Calendar? Calendaring service. Synchronize Microsoft Outlook Calendar folders on multiple PCs without a server. Two-way automatic and manual Outlook synchronization, even without opening Microsoft Outlook. Share Outlook Calendars with co-workers and friends via Internet. Web access for your Outlook calendar. Publish your Outlook Calendar to your website and blog. for a complete list of Google Calendar features click here. 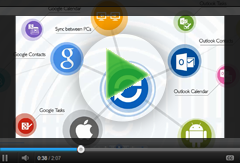 Sync Google Calendar with Outlook using Sync2 easily. Synchronize multiple Outlook Calendar folders and subfolders with Google Calendar. Google Calendar sync will be done automatically and will not create duplicate events or appointments. Google Calendar sync with Outlook on multiple PCs or one PC to multiple Google accounts is supported, all you have to do is just create synchronization profiles on each computer. Embed your Outlook Calendar to your website to access or share it online. Sync Outlook Calendar appointments and meetings in just few clicks. Setup scheduled Outlook Calendar sync to synchronize changes automatically. Any changes made in Outlook Calendar folders will be synchronized as soon as you connect to the internet or local network without a need for a server. Share Outlook Calendar with colleagues, friends and family easily. Sync Outlook Calendar or Contacts with Google and access Outlook Calendar on your mobile device. After synchronization is completed and your Outlook Calendar is available via Google just turn on the Auto-sync option in Accounts & sync settings screen on your Android phone. Or just synchronize Google Calendar with your iPhone, Blackberry or iPad to access it. Sync Google Calendar with Outlook and embed the Google Calendar on your website or blog. Synchronize selected Outlook Calendar with shared Google account to share your Calendars with others. *GOOGLE and Google Calendar is a trademark of Google Inc.